« Desmond Dupré, lutenist to Alfred Deller, and much more besides. Read any nineteenth-century English novel, from Jane Austen through Dickens to Hardy, and somewhere in it you’ll find a woman – probably the heroine – playing the piano. Throughout that century, educated women were expected to be able to play the piano and were often encouraged to study other instruments such as the harp, for the purposes of domestic music-making. But they were not expected to perform in public, still less in orchestras. As the musicologist Marion Scott observed in 1918, although the “lady violinist” was accepted by the 1880s, the presence of one on the concert platform was still seen as “striking”. This was the musical society into which Nellie, Kate, and Mabel Chaplin were born into a prosperous London family in 1857, 1865, and 1870 respectively. 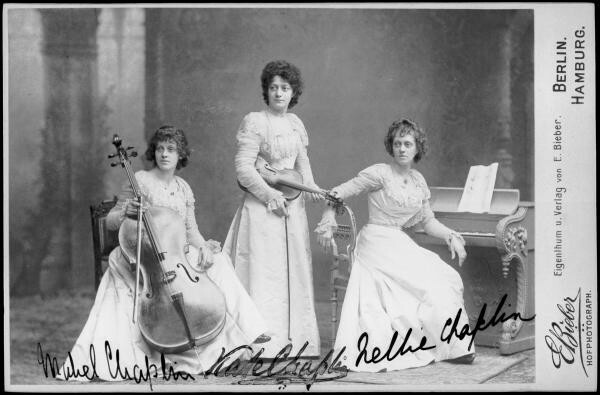 All three sisters showed early talent, and studied first at the London Academy of Music and later with celebrated teachers on the continent: Nellie in Hamburg with Elise Timm, a leading exponent of the Deppe piano method, and the two younger sisters in Brussels – Mabel with the cellist and gamba player Édouard Jacobs and Kate with the famous Belgian violinist, teacher and composer Eugène Ysaÿe. As soloists and ensemble players, these three women would navigate the world of public music-making for the next half-century. Throughout the 1880s, Nellie and Kate were already publicly performing the standard repertoire of Mozart, Tchaikovsky, Beethoven, Schumann, Mendelssohn, and their own contemporaries. That they were highly talented is clear from a review in Musical World as early as July 1881: “Miss Kate Chaplin … demonstrated how thoroughly adapted [the violin] is to well-trained feminine executants”. In 1883 another critic wrote that Kate “ bids fair to become a star, and to shine brilliantly amongst lady violinists“. In June 1889, aged just 19, Mabel joined her sisters on the London concert platform for their first concert as a trio, playing Rheinberger and Schumann. January 1893 saw Kate and Nellie performing for Queen Victoria and being rewarded with jewellery made of diamonds, rubies and pearls. In that year, Mabel won first prize in cello at the Brussels Conservatoire, “the first English girl to carry off that honour”. She played her first solo concert with Emil Sauer, a piano virtuoso and student of Liszt, in March 1895, at the Queen’s Hall, and later that year was a soloist at the last night of the Proms, under the baton of Henry Wood himself. Nellie, meanwhile, opened her own piano school in London and was teaching as well as performing. After a stellar early career, Kate appeared less often as a soloist from about 1896, but the Chaplin Trio soon became well known and held regular chamber music series, both by themselves and with others to encompass piano quartets and quintets. Up to 1900 they played in 183 concerts in London, around Britain – and abroad, winning acclaim as far afield as Berlin in 1899, where they “entirely won the recognition of their critical Berlin audience, a success which is notoriously difficult to achieve”. Please subscribe to this blog – in the top right corner – and receive notifications of new posts by e-mail. In terms of getting information, this is preferable to “liking” the blog (though you can do that too), as Facebook’s money-making system limits the number of people who see our news feed, to as little as 10% of the total sent! The sisters were successful and ambitious. Perhaps unsurprisingly, they chose to work in quartets and quintets with other female musicians who, like themselves, were excluded from paid employment in a profession dominated by men. Apart from harpists, no women were admitted to British orchestras till 1916 and, as Paula Gillett describes in her fascinating book, Musical Women in England, 1870–1914: “Encroaching on All Man’s Privileges”, conservatory-trained women were often forced to perform in low-paid ladies’ ensembles in tea-rooms or department stores, in order to make ends meet. The sisters’ acquaintance with women involved in the suffragette movement, such as the folk-dance revival specialist Mary Neal (who performed with them on several occasions), might also have been influential. Even in 1916, when Kate and Mabel formed the Chaplin String Quartet, its other members, though they varied, were always female. But where is early music in all this? So far, so Romantic. The Chaplins’ central repertoire, especially in the early years, was overwhelmingly Romantic and “modern”, including composers contemporary to them of whom we hear little or nothing today. But from the turn of the century they also – and in this they were truly innovative – began to revive “ancient” (i.e. Baroque and Renaissance) music for presentation to a wide audience in large venues. The watershed event was their “historical concert” in October 1903, featuring Purcell’s Golden Sonata, a Scarlatti keyboard sonata (played on the piano), and a trio by Rameau, as well as some Bagatelles by Dvořak. The next year, Nellie was introduced to the harpsichord by Arnold Dolmetsch, of which more in a later post. That summer she played a Bach double harpsichord concerto in one of Dolmetsch’s concerts at Clifford’s Inn (one of the old London Inns of Chancery, demolished soon afterwards). From then on, Nellie and the Chaplin Trio concentrated almost entirely on music by Baroque and earlier composers. Soon after Nellie began to play the harpsichord, her two sisters, doubtless under her influence, also began to learn old instruments, the viola da gamba and viola d’amore. Between 1904 and 1930 they notched up, in person and on radio, 140 performances of “old music”, in particular “ancient music and dances”. From July 1904, the early music concerts were usually themed, and presented as “ancient music”, “old world music”, or “Elizabethan music”. 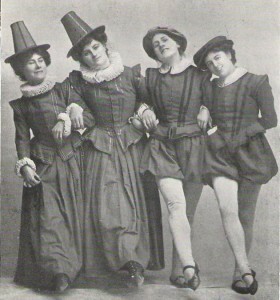 To select just a few from their scores of appearances, in November 1906 the sisters played in a concert featuring “early keyboard instruments” in which their performance of Daquin’s “Le coucou” was a hit; in October 1907 Nellie played Bach, Scarlatti, Gibbons and the 18th-century Oxford composer and organist Philip Hayes, while Mabel offered “French pieces for the gamba played on the cello”. By 1912 the Chaplins, and particularly Nellie, were already regularly associated with presentations of “old English dances of the kind with which Miss Chaplin has happily made us familiar”. Dance became an integral element in the performances almost at once. Announcements and reviews headed, for example, “Miss Nellie Chaplin’s Performance of Ancient Dances and Music” (June 1906, November 1907), or “Nellie Chaplin’s Ancient Dances and Music” (two performances in Manchester, February 1910, many others between 1913 and 1919, and some after 1924) are typical. Such was their popularity (and Nellie’s business acumen) that the sisters often gave a matinée and evening concert on the same day, or concerts on consecutive days, at the same venue. In this popular “multimedia” model the sisters found their niche. They played music illustrations for lecture recitals, such as one entitled “Music from the Restoration to Handel”, presented in London in February 1928 and featuring Locke, Blow and Purcell, at which Nellie played Purcell’s “magnificent Toccata in A” and the trio gave his E minor Sonata. In a BBC radio programme from March 1926, relayed direct from Wandsworth Baths, the trio shared the programme with Edmund Fellowes, who sang some Elizabethan songs to his own accompaniment on the lute. Choirs were involved, too, often singing what we might consider today a bizarre combination of madrigals and folksongs in modern arrangements. One concert in April 1916, given by the Oriana Madrigal Singers with the Chaplin Trio, featured everything from “Sumer is icumen in” to a contemporary partsong, with “two Eastern songs for women’s voices with harp accompaniment, by Mr. G. von Holst” (review in The Times, 12 April 1916). The Chaplins provided “instrumental contrast” with Handel, Rameau, and English virginals music. From about 1924 the sisters began to feature in radio broadcasts, both as soloists and the trio. A good example is “An Elizabethan programme”, an incredibly mixed radio programme from October 1925, in which the Chaplin Trio shared the programme with a glee club, a tenor soloist with accompanist, and, “at the piano, Mrs Parry” – presumably accompanying the choir, for the Chaplins are listed as performing on harpsichord, viola d’amore, and gamba. Each sister had a solo spot in this broadcast – the pieces were drawn from the Fitzwilliam Virginal Book and Parthenia, and Mabel played “Diversions on a Ayre by Gilles Durant, 1550” – and the trio concluded with an arrangement of “Kemp’s Jigg”. Of course, radio couldn’t convey the visual impact of the dance, but the infectious rhythms of pavan, galliard, hornpipe, and jig must have had many toes tapping in British drawing-rooms. Thanks are due to Jeremy Barlow, who first mentioned the Chaplin sisters to Semibrevity; Dr Brian Blood of the Dolmetsch Foundation; Professor Freia Hoffmann of the Sophie Drinker Institut in Bremen, who kindly shared her very extensive research; Sandy Mitchell; and Michael Mullen and Elizabeth Wells of the Royal College of Music.